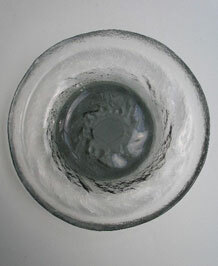 This is a beautiful glass dish/plate dating from the 1970s and designed by Pertti Santalahti for Humppila (Finland). It is smooth like melted ice to the top surface and the underside fantastically rippled and textured with clear glass around the outside and swirls of smokey black to the centre. It is a gorgeous thick and heavy piece of art glass that looks amazing on display yet is practical enough to be used. Signed to the base Pertti Santalahti Humppila Finlandia.